This pithy little image has been making the rounds on the internet lately. It’s clever, of course, if a bit oddly formatted (maybe that’s part of the joke), and yet, I can’t help but think that it’s on to something. An ongoing theme of my posts here has been the value of play to gaming. That may seem tautological or trite, but as I wrote last month, it’s entirely possible to put other elements that we find in a game (e.g. story, art, etc.) above the element of play. And back in March, I wrote about how we could clarify theory by treating gaming as distinct from art, and valuable even without that appellation. I’ve always vaguely felt that Tetris would be the best illustration of those suggestions, at least with regard to specifically video-based gaming, but hadn’t yet struck on a “reading” that was strong enough to forward. Even that word, “reading,” with its connotations of literary interpretation, seems out of place, as I’ve explained elsewhere. If I’m right about the value of play over the usual attitudes and behaviors associated with “art,” to play Tetris is as close as we need get to interpretation. The problem was that there seemed to be so little on which to hang an explanation of how play would stand in for art in Tetris, and in large part because there were so few clues about it. Games with more representational graphics or a sense of narrative give us those sorts of clues. I’ve suggested before that the familiar trappings of art and narrative can help indicate to players the structure of play, and it’s probably inarguable that we likewise take those trappings as prompts for how we’re to understand what it is we’re doing when we play successfully. But Tetris is largely non-representational, non-narrative – almost certainly the most successful video game of that type. So even while it should serve as the clearest example of the principles I’ve argued for in the past, it’s also the most difficult to frame in explanation, and for the very same reasons. That’s a particularly appealing place to start when working backwards, because it comes to us as an apparently naïve statement – naïve in the sense that we didn’t solicit it, and it doesn’t appear to have been formulated as a response to theory or theoretical inquiry. For all we know, it’s someone’s spontaneous reaction to having played the game, and the fact that it’s caught on around the environs of the internet suggests that many other people have had that reaction as well. From that starting point, it’s easy to work back to mechanics. 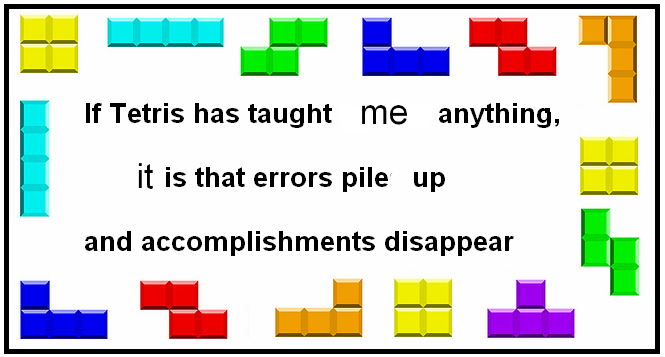 How did Tetris teach the anonymous author that “errors pile up and accomplishments disappear?” The latter is actually instrumental to play: player gain points by making rows of blocks disappear, the more at once, the better. The former is a consequence of the latter: errors crop up in the course of trying to fit shapes together in order to form those rows, and the accumulation of those errors is how the game provides challenge. Other elements of play are built around those two dynamics. For example, as the player’s score rises, the rate at which shapes fall increases, which in turn makes it more likely that the player will commit errors. But we can take it further than that. Those two dynamics are description of the course of play, but they don’t quite describe play itself. What the player does, the behavior that results in either errors or accomplishments, is turn shapes. Play itself is a process of working with what you’re given, and the work involved is that of organization by way of orientation. It’s tempting, at this point, to frame that “reading” in a broader context. Tetris was designed and originally programmed by Alexey Pajitnov, who was working, at the time, in the computing branch of the Academy of Science of the USSR. Based on that background, it would be rather simple to “read” Tetris as a game about the limitations of social and political conformity: the accomplishments of getting people to line of in perfect rows are fleeting, while the inability to make them fall in line ultimately brings in the entire system. The shuttle launch cut scenes that rewarded milestones in early commercial versions of the game even seem to buttress the political and economic interpretation, recalling, as they do, the space race of the Cold War period. But that reinforcement can also serve as warning. The cut scenes, after all, are an artistic intercession on behalf of artistic interpretations. Yes, we can interpret Tetris in political terms, but we need not do so. We can also simply play it, and play it as a game that subtly inverts the associations between accumulation and accomplishment, reduction and loss.